THE TENTH Holy Imam , like his father , was also elevated to the rank of Imam in his childhood . He was six years old when his father Imam Muhammad al – Jawad(a.s.) died . After the death of al – Ma’mun , al-Mu`tasim succeeded him , and was later followed by the caliph al-Wathiq . 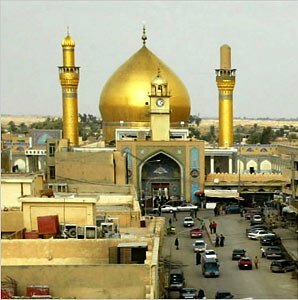 In the first five years of the reign of al-Wathiq , Imam Ali al-Hadi (an-Naqi(a.s.) ) lived peacefully . After al-Wathiq , al-Mutawakkil came to power . Being too occupied in State affairs , al-Mutawakkil did not get any time to harass the Imam and his followers for four years . But as soon as he freed himself from State affairs , he started to molest the Imam . Although enraged by this news al-Mutawakkil still preferred the diplomacy of not arresting the Holy Imam(a.s.). Under the garb of pretended respect and love towards the Imam , he planned to put him under life imporisonment after inviting him to his palace. Prior to his imprisonment , in a series of correspondence with the Imam(a.s.), he expressed the view that he was convinced of all the claims of the Imam(a.s.) and was ready to settle them amicably . He wrote to the Imam(a.s.) that having been acquainted with his great personality , his matchless knowledge and his peerless attributes , he was impatiently looking forward to the honour of seeing him , and he most cordially invited him to Samarrah . Although the Imam(a.s.) was well aware of al-Mutawakkil’s treacherous intentions , he anticipating the fatal consequences of refusing the offer , reluctantly decided to leave Medina . But when the Imam(a.s.) arrived at Samarrah and al-Mutawakkil was informed about it , he took no notice of the Imam’s arrival. when asked about where the Imam (a.s.) should stay , he ordered that the Imam should be put up in the inn meant for beggars , destitutes and homeless people. Al – Mutawakkil who was a deadly enemy of the Ahl-ul-bayt , removed the Imam(a.s.) from this inn and entrusted him to the custody of a stone – hearted brute named Zurafah . But , by the grace of Allah(swt) , his enmity was, in a short time , transformed into love and devotion for the Imam(a.s.). When al-Mutawakkil learnt about it, he shifted the Imam(a.s.) into the custody of another cruel man called Sa’id . The Imam(a.s.) remained under his strict vigilance for a number of years , during which he was subjected to boundless tortures . But even in this miserable imprisonment , the Imam(a.s.) kept devoting himself at all times to the worship of Allah(swt) . The watchman of the prison used to comment that Imam Ali al-Hadi(a.s.) seemed to be an angel in human garb. When Fath ibn Khaqan became the vizier of al-Mutawakkil , he being a Shi`ah could not stand the idea of the Imam’s captivity . He endeavoured to have him released from imprisonment and arranged for his comfortable residence in a personally purchased house at Samarrah . Still al-Mutawakkil could hardly refrain from his antagonism to the Imam(a.s.) and he appointed spies to watch the Imam(a.s.) and his connections . But through all these attempts , his hope of creating some fabrication to prove the Imam’s activity against himself could not be realized. In the time of al-Mutawakkil there was a woman named Zaynab who claimed to be a decendant of Imam Hussain(a.s.). Al-Mutawakkil sought the confirmation of Zaynab’s claim from the Imam(a.s.) and said : “`That as the beasts are prohibited to eat the flesh of the descendants of Imam Hussain(a.s.) he would throw Zaynab to the beasts and test her claim” .’ On hearing this , Zaynab began to tremble and confessed that she was a fake . Al-Mutawakkil then ordered the Imam(a.s.) to be thrown to the beasts to test the claim . To his great surprise , he witnessed the beasts prostrating their heads before the Imam(a.s.). Once Al-Mutawakkil happened to suffer from a serious malady which was eventually declared incurable by his physicians . When the Imam(a.s.) was approached for some remedy , he prescribed an application which resulted in a spontaneous cure. Once al-Mutawakkil was informed that the Imam(a.s.) was preparing a revolt against him . Thereupon , he ordered a detachment of the army to launch a raid on the Imam’s residence . When the soldiers entered his house , they found him sitting on a mat , reciting the Holy Qur’an. Not only al-Mutawakkil , but his successors’ opposition to the Imam(a.s.) was fierce . After the death of al-Mutawakkil , al-Mustansir , al-Musta`in and al-Mu`tazz carried on the same mission of harassent against the family of the Imam. al – Mu`tazz , understanding the uncontrollable and intense devotion of the people towards the Imam(a.s.) , eventually contrived the Imam’s assassination. He got him poisoned through an ambassador which resulted in the Imam’s death within a few hours . The martyrdom occurred on 26th Jumadi-as-Sani 254 AH , and his funeral prayer was conducted by his son , Imam Hasan al-Askari(a.s.). 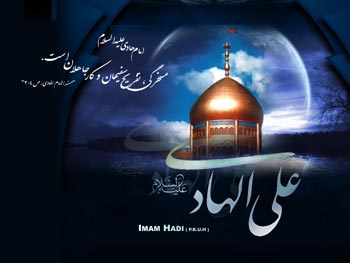 The Imam(a.s.) was only forty-two years old at the time of death . The period of his Imamate was thirty-five years . He was buried in Samarrah, Iraq.